Serving Up Thanksgiving Comfort Food All Year Round With Our Great Turkey Sundaes! Well, now, thanks to Original Ferrell’s Donuts located at 1761 17th Ave., Santa Cruz, you don’t have to wait until Thanksgiving to splurge. Original Ferrell’s has been serving up the best turkey sandwiches in Santa Cruz area for the past 8 years. Our secret ingredient? We roast only flavorful all-natural turkeys. 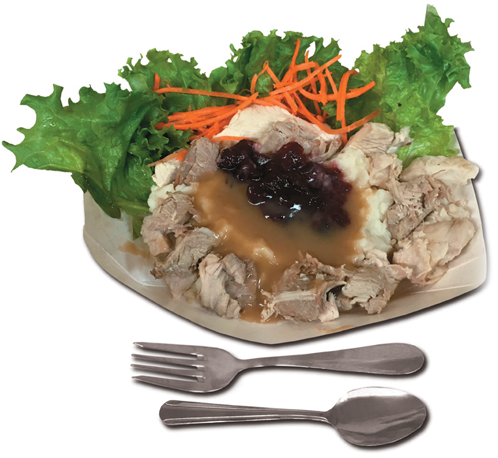 As our turkey sandwiches have become a big hit with locals and nearby business people, many customers have been lobbying for turkey dinners for years. We listened to our loyal following by adding a Turkey Sundae which consists of: white and dark turkey meat, resting on two scoops of fluffy mashed potatoes, topped with yummy turkey gravy. Oh, and least we forget a dollop of tangy cranberry sauce will top off your Turkey Sundae. We think you’ll love it…!